A6 Windows have been Installing Upvc Roofline in Manchester for more than 25 years this is the name given to the timber Fascias ,soffits and barge boards which finish off the area around the eaves or roof of your property and are open to daily attack throughout the year from snow, rain, wind and even the blistering summer sun. We offer long-lasting weather protection for your property from the elements with our taylor made Upvc roof trim products and you'll be making an important, cost-saving investment fascia boards , soffits and guttering are among roofline components that play a vital role in keeping you and your property dry and help to prevent water damage in hard-to-reach places.Maintaining your timber fascias and soffits on your property is not only time consuming, it costs money too.Rotting timber can really let your property down causing structural damage,and water penetration . 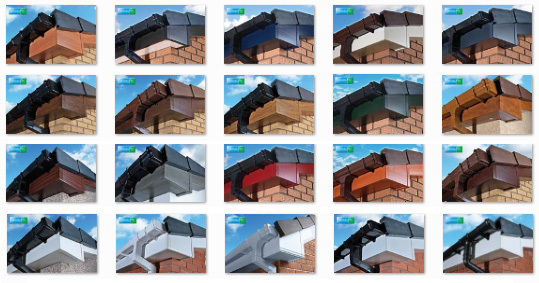 Before rot and decay set in your roofline consider replacing your fascias and soffits with our quality, weather-resistant, long-lasting UPVC (plastic)fascias and soffits,no more painting nor repairing, and know when the next bad weather hits, your property is protected? With A6 Windows unbeatable value-for-money and reputation for quality of service, call now and discuss your needs with our friendly staff You'll be surprised how inexpensive it can be to replace your old decaying fascias and soffits on your property and just think of the time and money you'll save on maintenance in the long term ! they will improve the look of your property, also add value to your property . Being approved installers of Swish and Homeline upvc products enables us to offer an extensive range of Roofline products to suit you needs ,together they provide the best roofline system on the market for all areas of your property ,gable ends,garage garage roof,canopy, felt roof ,dormers .Our installers have many years of experience and workmanship is to the highest of standards Any roofer or roofing contractor can provide you cheap replacement fascias ,soffits and guttering but very often product quality or installation isn't as good and often the original timber fascias and soffits on your property are just capped over with thin upvc fascia All our work is total replacement roofline NOT covered over ,We use 20 mm thick upvc fascias . Circulating air in the roof space of your property reduces the build up of condensation which causes damp, mould and rotten timbers. Our Ventilation systems ensure a long-life for roof timbers. Choose between discreet over UPVC fascia ventilation or continuous soffit air vents to protect your UPVC roofline and roof from moisture retention ensuring you do not get damp into roof timbers We will be happy to provide a free estimate for you to compare our prices and are sure you will be amazed at the cost and quality of our product . 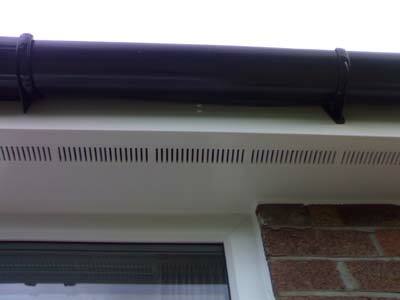 Attach 9mm solid uPVC soffit boards to the underside of the spars. 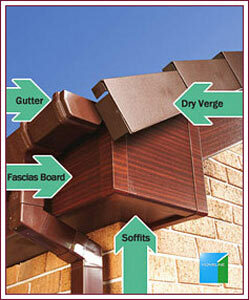 Attach 20mm solid uPVC fascia boards to the front of the spars. Attach 20mm solid uPVC barge boards.